A carbonyl group is a functional group in biochemistry characterized by a carbon atom double bonded to an oxygen, with a larger molecule. This structure creates a resonance hybrid structure within the molecule, in which the electrons are continuously redistributed between the carbons and the oxygen, which can allow the molecule to hold more electrons and therefore participate in more reactions. A carbonyl group can be seen in the image below, with R and R’ representing more carbons in a larger chain which the central carbonyl group is attached to. The carbonyl group serves the functional role of destabilizing the bonds within the carbon chain. The electronegative oxygen atom tends to attract more electrons than the carbon it is bonded to within the carbonyl group. As such, the carbon within the carbonyl group will become more positive, as it loses the electrical influence of the negative electrons that are drawn toward the oxygen. The carbon is now called a carbocation, because it has a slight positive charge. This slightly positive charge on the carbon of the carbonyl group sets up a wide variety of possible reactions that result from the change in electron distribution. Besides creating a slightly positive carbocation within the carbonyl group, the influence of the oxygen atom and resulting carbocation can stabilize the formation of a carbanion intermediate in one of the adjacent carbons. The carbonyl group is known informally as an electron sink, which is able to “soak up” extra electrons in the molecule. These extra electrons will flow between the carbons and the oxygen, temporarily creating double bonds which fade to more electrically negative and positive areas. This destabilization allows for a number of important reactions. Many reactions that form carbon-carbon bonds are started with the creation of nucleophiles and electrophiles with carbonyl groups. The carbon of the carbonyl group is able to accept electrons to form carbon-carbon bonds as the electrophile, while a carbanion intermediate (created by other carbonyl group) can serve as the nucleophile and donate the electrons. Biochemical processes in organisms manipulate the activity of the carbonyl group through metals and acids in the environment reactions will take place. Various acids and metals will react with the oxygen, lowering its electronegativity. In turn, the oxygen will take less of the electrons from the carbon molecule it is attached to. This favors the formation of the negative carbanion intermediate instead of a carbon-carbon double-bond, and leads to the formation of new carbon-carbon bonds. Similarly, imine groups cause similar delocalization of negative charges on carbons, and can facilitate the same kinds of reactions. Imine Group – Similar to a carbonyl group, but created with nitrogen as the electronegative atom which destabilizes the bonds between adjacent carbon atoms. Carbocation – A carbon in a molecule that carries a slightly positive charge, allowing it to receive electrons as the electrophile in common biological reactions. Carbanion – A carbon with a slightly negative charge, making it a nucleophile capable of donation electrons. Carboxylic Group – A carbonyl group bonded to a hydroxyl group (OH). 1. Two forms of carbon chains differ only in the placement of the carbonyl group within the chain. In aldehydes, the carbonyl group is at the end of a chain of carbons. 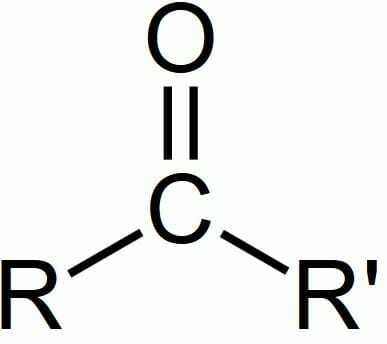 In ketones, on the other hand, the carbonyl group is somewhere in the middle. Aldehydes are much more likely to participate as the electrophile in a nucleophilic substitution reaction. Why would this be? A is correct. An aldehyde has only a small hydrogen atom attached to carbonyl group, where a ketone will often have a large and cumbersome carbon chain attached to both sides of the carbonyl group. The extra electrons and physical presence of the carbon chains on both sides makes the ketone much less likely to participate in a nucleophilic substitution reaction. However, the aldehyde is unhindered by the small hydrogen, and the relatively small amount of electron flow it receives at the end of the molecule creates a strong carbocation within the carbonyl group, which will gladly receive electrons as the electrophile in a reaction.